I've played some excellent Euros so far this year that have all felt pretty fresh and original - the fantastic Mammut, for example, or the hilarious Mord Im Arosa. 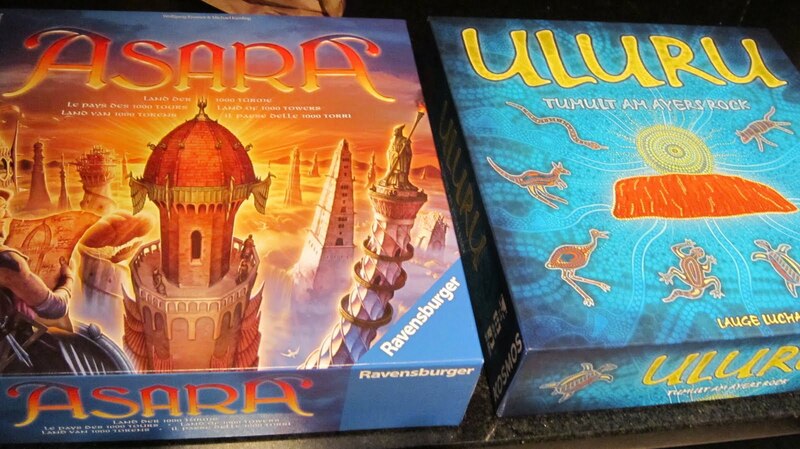 Now I think I can add two more to the list: Asara, a gorgeously produced game from the team of Kramer and Kiesling who brought us the great Spiel des Jahres winner Torres, and Uluru, a quick and clever puzzler from the previously unknown Lauge Rosendahl. 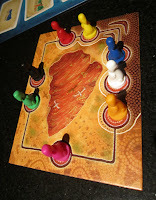 Asara is an exceptionally fun game about building towers. Big towers. The largest, in fact, in each of the five colours available. Asara is also a game that when described in detail sounds rather dated and unoriginal. I mean, if I were to try to categorize it, I'd have to to say it's kinda like a worker-placement game but with majority scoring similar to older games like El Grande or even Manhattan. Yeah, sounds like every other German game from the past ten years. But that really doesn't do it justice as it is actually a very tight, easy-to-learn design, combining hand and money management, turn order, and set collection in such a balanced way that it feels exactly like it was created by master designers (and it was). 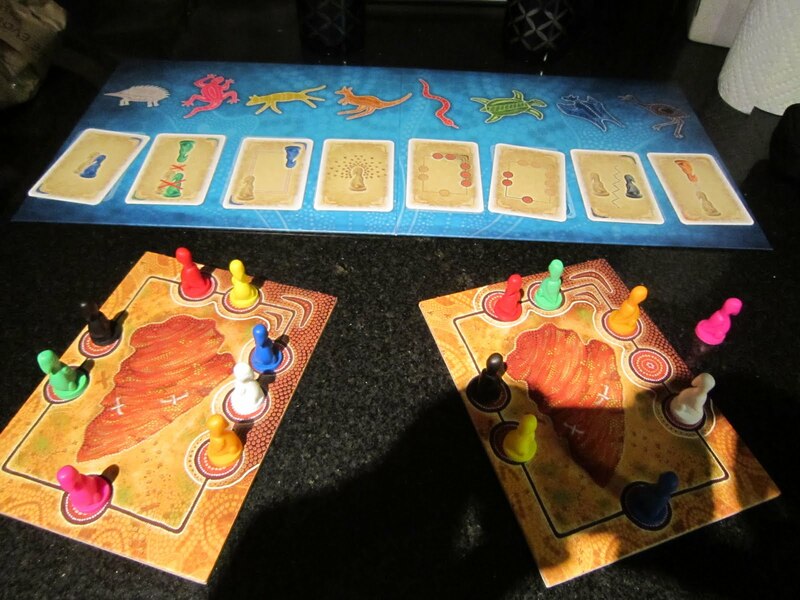 Asara strikes such a fine balance between tension and fun in about the perfect length of time that it seems to me to be an excellent choice for both families and gamers. Oh, and add to that production values from Ravensburger that are out of this world and it's no wonder Asara was nominated for the 2011 Spiel des Jahres. 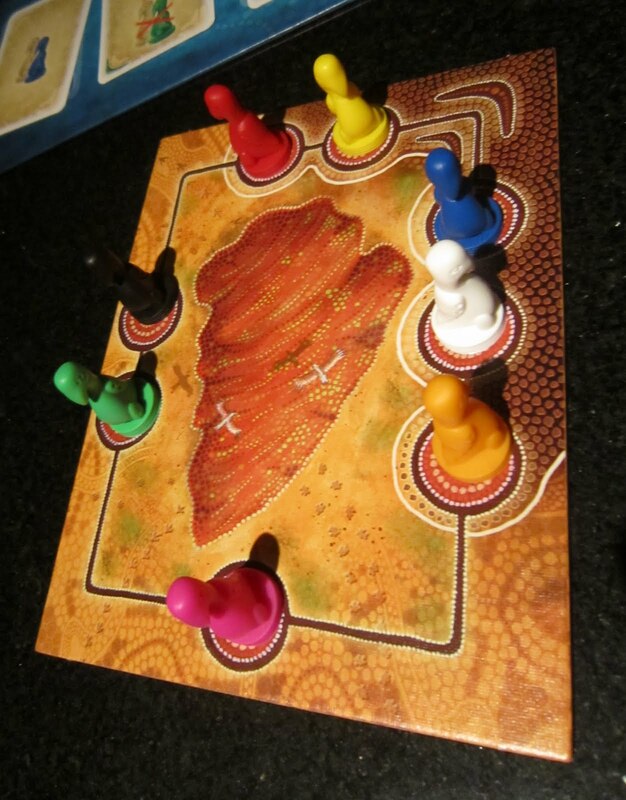 Uluru is a different beast altogether: a fast thinky game about birds sitting around a table who have very specific wishes about exactly where they want to be placed. Seriously. You remember those logic puzzles with the grids where you suppposed to determine the placement of each character according to a rather opaque set of clues? Yeah, well, this is the board game version with a timer. Players flip a card for each the eight coloured birds determining what each bird wishes - you know, things like sitting right beside the blue bird or at the opposite side of the table as the black bird or to even just sit at the table altoegther. The sand timer is flipped and everyone has a very short amount of time to make all their birds' wishes come true. Stones are handed out for wishes unfulfilled and at the end of the round, the player with the least stones wins. In theory, it all sounds very dry and logical, but in practice the pieces are so pretty and the rounds so quick that the game is quite light and enjoyable. And I'm awful at it. Just awful. But I'd play it again in a second.